The effects of repeated exposure to anthropogenic sources, such as Navy Mid-Frequency Active (MFA) sonar, need to be measured across both short-term and long-term spectra. To evaluate potential impacts of these sources on a routinely exposed population of whales, a parallel study of a nearby population where they are not used should be conducted to provide a baseline of unexposed behavior and population health. 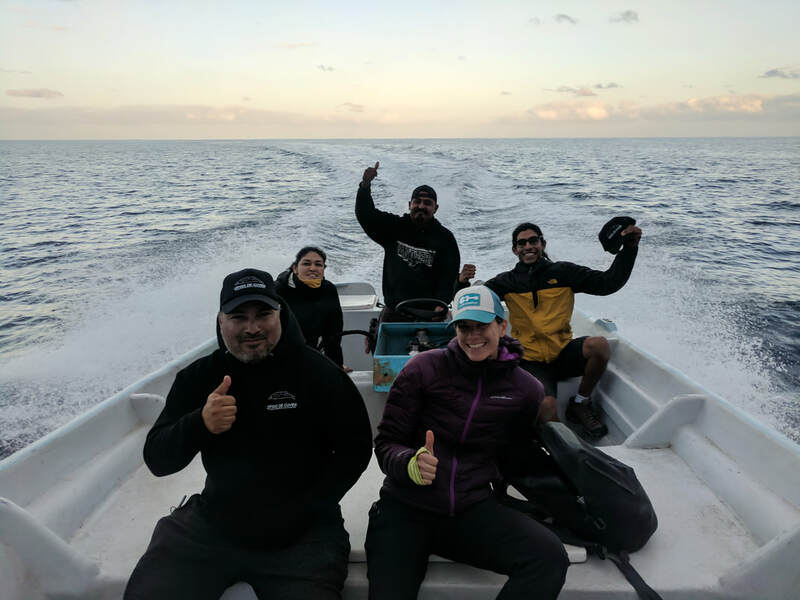 In October, we headed South of the Border to begin a collaborative study looking at the demographics and dive behaviors of Cuvier’s beaked whales at Guadalupe Island, Mexico. 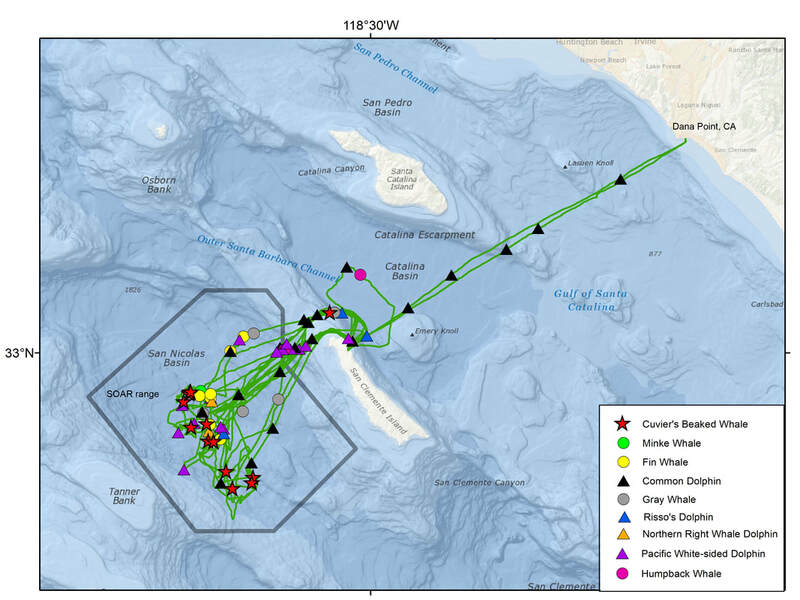 The purpose of this project is to better understand the impacts of sonar use on the whales at the Navy range off San Clemente Island, CA by studying animals at a comparative site, Guadalupe Island, that have little to no exposure. We are working with Gustavo Cárdenas-Hinojosa and Dr. Lorenzo Rojas Bracho from the Comisión Nacional para el Conocimiento y Uso de la Biodiversidad (CONABIO). ​Guadalupe Island is located 150 miles off the west coast of Mexico’s Baja California peninsula. It measures 22 miles long and 6 miles wide with the highest peak, Monte Agusta, rising to 4,259 ft. 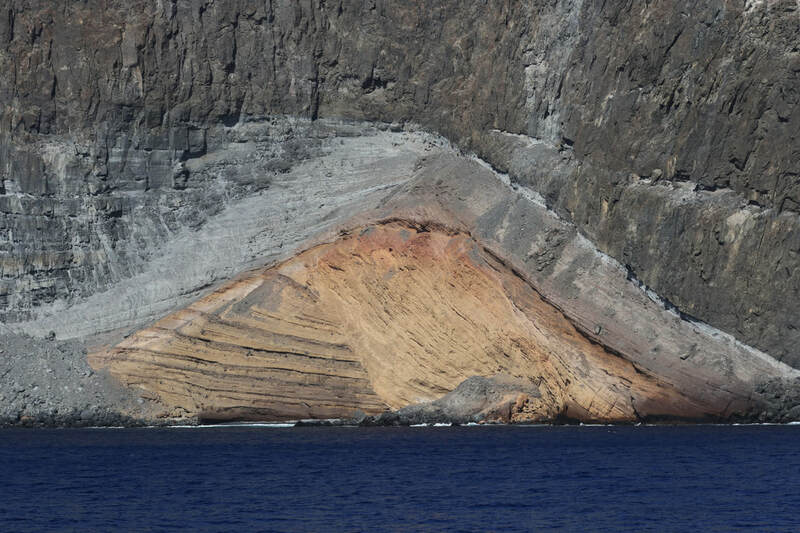 It is a volcanic island consisting of two shield volcanos (named for its low profile resembling a warrior’s shield) with captivating colors and mesmerizing geological patterns that reveal its formation to the trained eye. Greg’s geology skills came in very handy! It’s desert-like appearance today is a stark contrast to its forested history, before lumber became a hot commodity. Hunters nearly wiped out both the endemic Guadalupe fur seal and the northern elephant seal populations that bred there. Goats replaced wild species which severely impacted the survival of both flora and fauna. ​Today, thanks to protection from the Mexican government, both seal species are thriving on the island. There are several endemic bird species including the Townsend’s and Ainley’s storm petrels that nest on a few islets on the southern end of the island. Guadalupe Island is one of the top five places in the world to see great white sharks. The water is crystal clear with visibility upwards of 100-150 feet. Research indicates that this is a mating ground, and with seals providing a plentiful food source, it is definitely sharky waters. It’s not recommended to go frolicking carefree in the water to cool off. We were lucky to have a few beautiful, curious individuals check us out. ​The island and the surrounding waters were designated as a biosphere reserve in 2005. 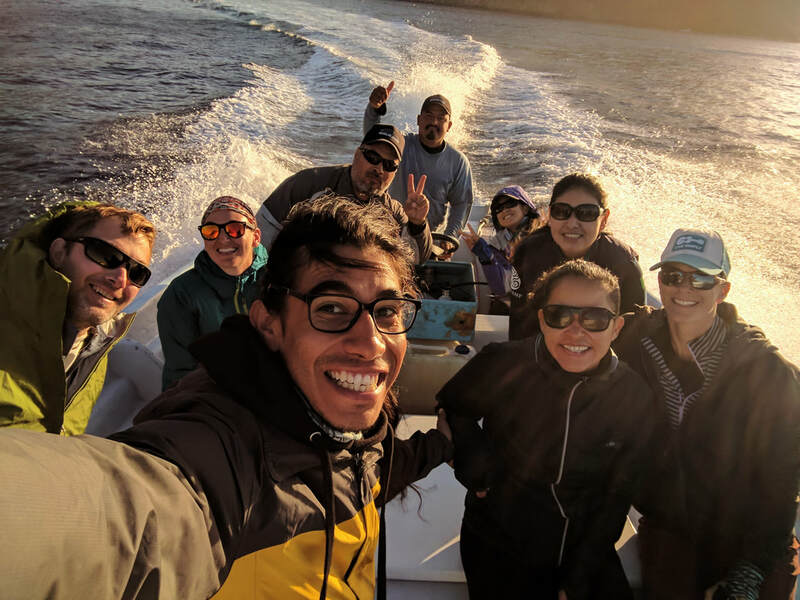 For the most part, it is wild and uninhabited except for a fishing community of approximately 200 individuals (abalone and lobster) that live on the island for 10 months out of the year at Campo Oeste. 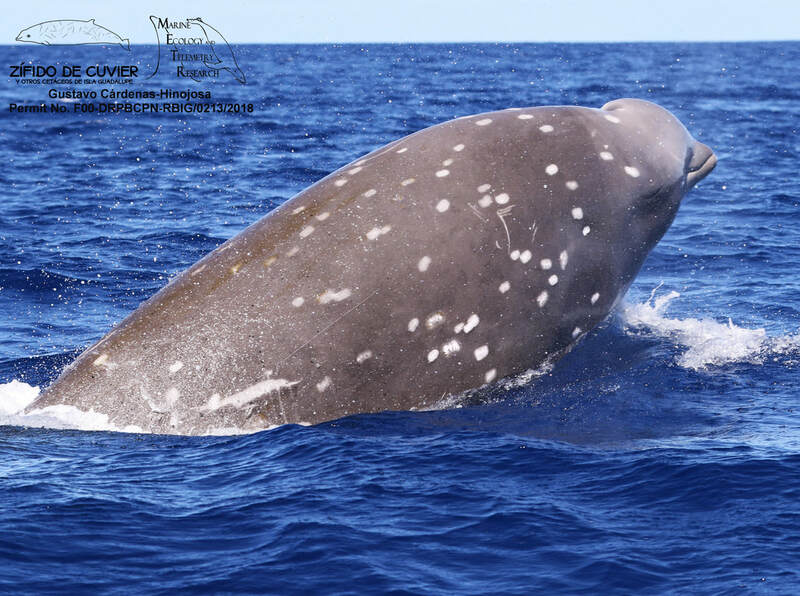 ​It wasn’t until recent years that Cuvier’s beaked whales were recognized as another regular species inhabiting the waters around Guadalupe Island. 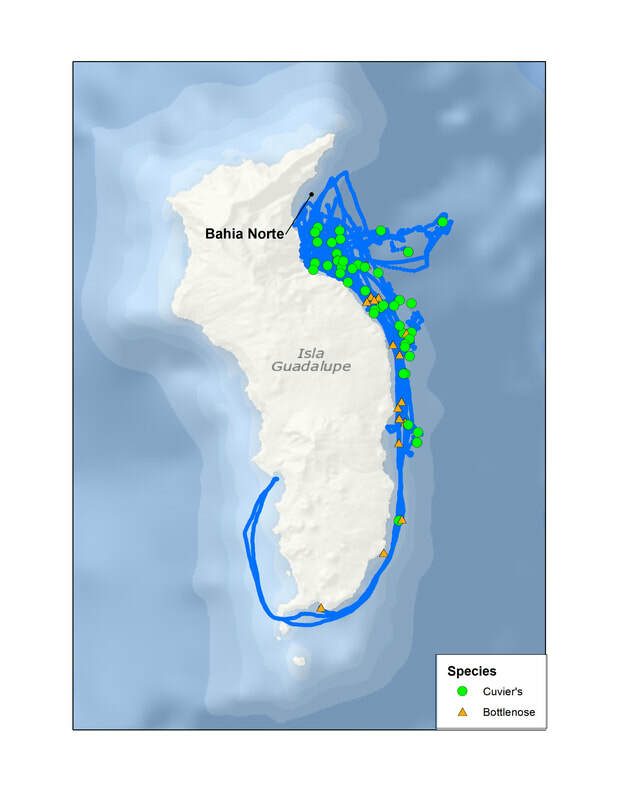 When several underwater videos documented them nearly a decade ago, researchers including Gustavo Cárdenas-Hinojosa decided to conduct a survey to see how many animals were in the area. 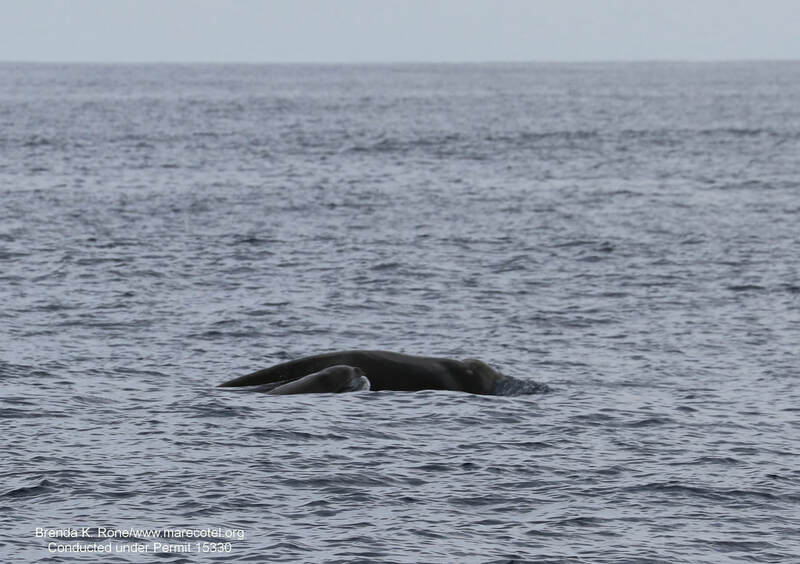 Fast forward 8-years and their efforts have demonstrated the presence of Cuvier’s beaked whales within close proximity to Guadalupe Island during multiple seasons, with some individuals spotted numerous times suggesting site-fidelity. Currently, there are 82 individuals in the catalog with new individuals added every trip. ​This is where MarEcoTel enters the picture. When assessing the nature and degree of anthropogenic impacts on a population, a key question is “compared to what?” This is particularly difficult to evaluate when no data exist for the population of interest prior to the introduction of the activity. Such is the case with Cuvier's beaked whales that live in and near the Southern California Anti-Submarine Warfare Range (SOAR), where they are frequently exposed to Mid-Frequency Active (MFA) sonar during routine military training exercises- the likes of which have been associated with mass strandings of this species elsewhere in the world. While there is a growing body of behavioral and demographic data on the SOAR population, there is little or no data from an ecologically-similar population of this species that is not regularly exposed to MFA sonar to which these data can be compared. Such an approach is proving highly valuable for evaluating impacts to Blainville's beaked whales at a training range in the Bahamas, led by researcher Diane Claridge with the Bahamas Marine Mammal Research Organization. On October 7th, we set sail from Ensenada to make the 150 mile run southwest to Guadalupe Island. During the rough 24+ hour crossing, a few of us were able to complete our last bit of field prep while most were just hunkered down wishing they could teleport themselves to the island already. We arrived at the northern end of the island in the early morning and before we had set up to begin surveying south, we had our first Cuvier’s sighting of the day before 8 am. Our second occurred before 9 am. Okay, this place definitely has promise. We had to pick up the research panga we’d be using from the far side of the island at Campo Oeste so after grabbing photos, we continued south. By the end of the day, we had made our way back north to Bahía Norte, our primary research area where a majority of the historical Cuvier’s sightings have been documented. This is because on the east side of the island, the water becomes very deep close to shore, and the island creates a lee from the prevailing NW winds. In the late afternoon, Brenda spotted several blows close to shore. She remembers asking just how close to shore do they see Cuvier’s. “Very close.” was the reply. She said, “Well, these look like they are on the beach!” Sure enough, we had a group of seven and away we went on the panga. Three sightings (10 individuals), day one; and if you think that sounds amazing, the following day, which was our first full day of effort, we had 11 sightings (34 individuals). This trip was filled with wondrous examples like this. There was that one late evening, while sitting on anchor, when we could hear the exhalations of a group passing close by us, or that casual first sighting of the day while having early morning coffee on the back deck without even trying to look for animals. 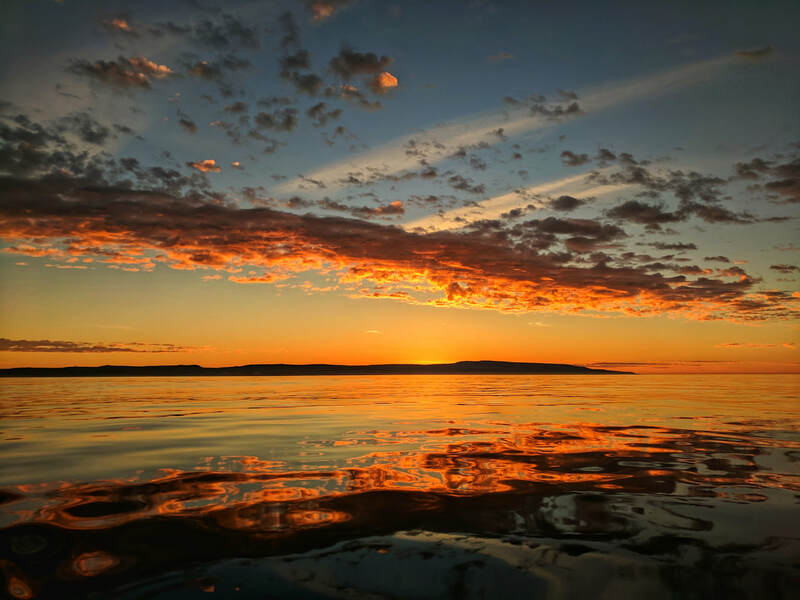 Compared to our California work where our average survey day is 100 nm of dedicated survey effort, and we often do not encounter beaked whales, this is definitely paradise. We were very fortunate to have those first few days of calm weather. It shows just what can be accomplished when the weather cooperates. 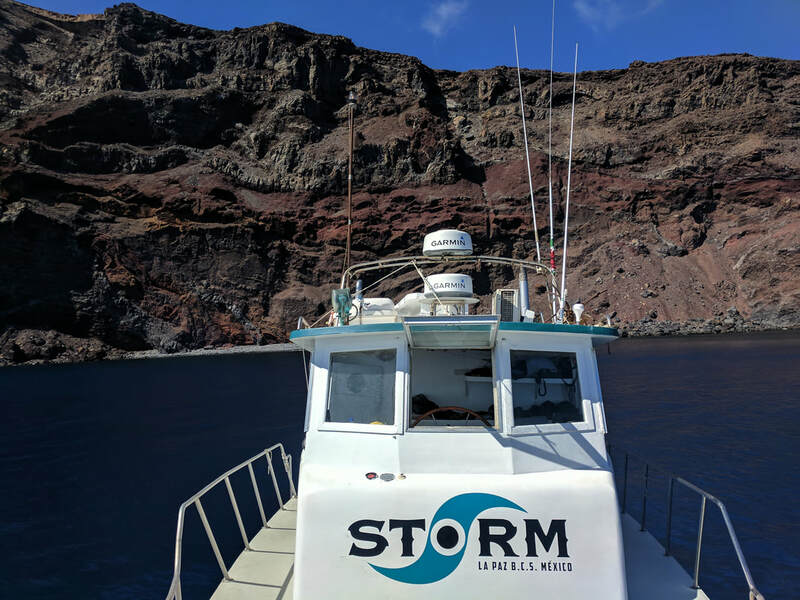 Unfortunately, we were fighting the effects of hurricane Sergio, and towards the end of our survey the winds wrapped around the island and we had lost our lee. Despite this, we accomplished quite a bit. 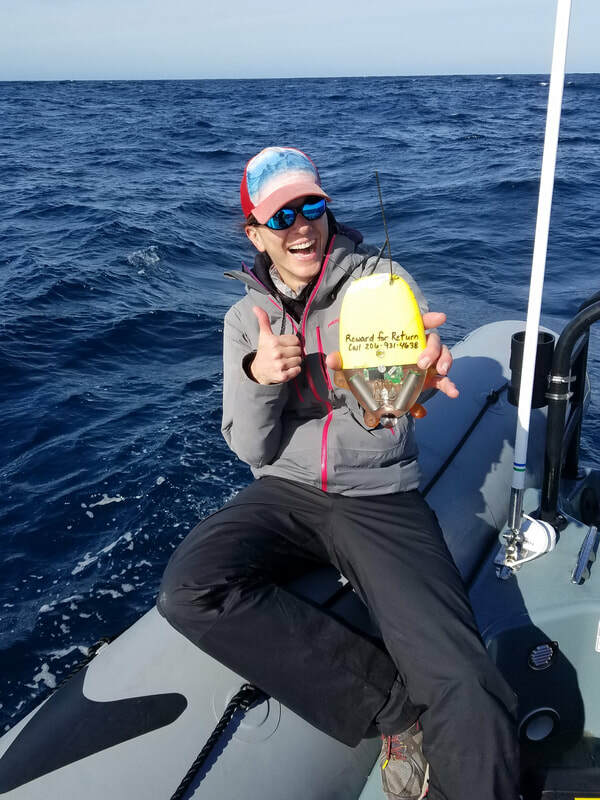 We documented 38 sightings (101 individuals) (Figure 1), deployed 4 satellite tags, collected two biopsy samples, one eDNA sample, one squid sample, and deployed 2 C-PODs (passive acoustic recorders). The only additional cetacean species we documented were bottlenose dolphins (Figure 1). What was astonishing was that we had more Cuvier’s than bottlenose dolphins! To put the number of Cuvier’s sightings into perspective, at SOAR, our average encounter rate is one sighting for every 18 hours of search effort. Needless to say, we are thrilled to have this opportunity to conduct research in such a special and extraordinary place. Figure 1. Survey effort and cetacean sightings during our October 2018 effort. The four satellite tags were deployed on four different individuals with transmission durations ranging from 18 to 26 days; they collected 1,256 hours of diving behavior from three of the four tagged whales. The basic pattern observed from Cuvier’s beaked whales in other regions was apparent, with deep, presumed foraging dives generally separated by a series of shallow dives. The individual median deep dive durations ranged from 56.6 – 74.0 min (max = 149.2 min). Individual median deep dive depths ranged from 991.5-1135.5 m (max = 2799.5 m). The median Inter-Deep Dive Interval ranged from 101.9 – 160.1 min; the longest time between presumed foraging dives was 485 min (8.1 hrs). Photographic matching identified 27 unique individuals. 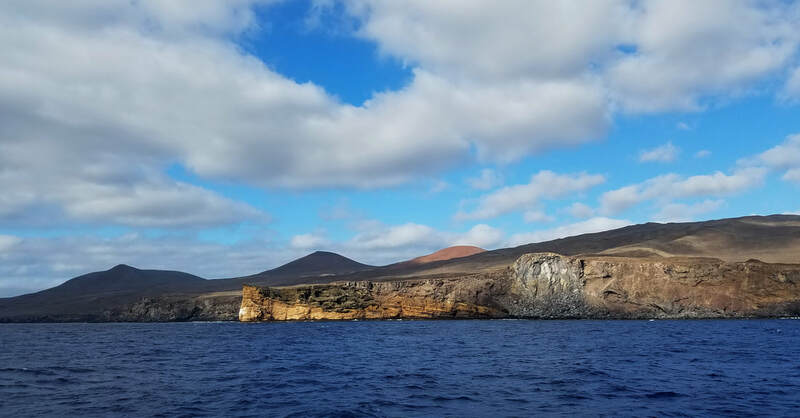 Individuals identified were matched back to an existing photo-ID catalog from Guadalupe Island, which includes 82 individuals from previous efforts and opportunistic photographs. Recaptures of individual whales span up to 11 years, with some individuals having been resighted 19 times, suggesting a high degree of site-fidelity. 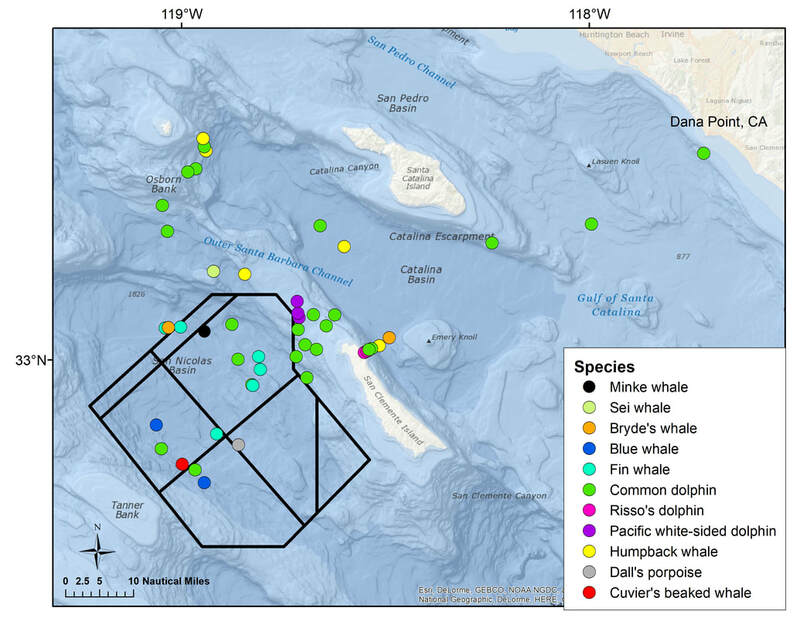 A comparison of whales identified at Guadalupe Island to those photographed in and around SOAR has not documented any individual movements between study areas to date. 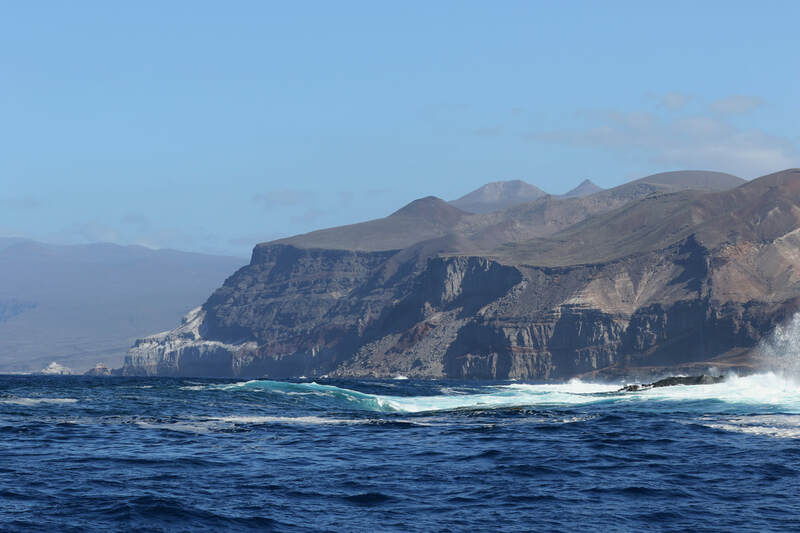 ​Our next field effort off Guadalupe Island will take place in May 2019. We are looking forward to working with our colleagues, friends, collaborators, and the crew from the M/V Storm again! We would like to thank our funder, the Office of Naval Research. In November, we completed our fifth and final field effort for 2017. This was the first research trip for our new vessel R/V Phoenix. When we arrived in California at the start, we had to hit the ground running in overdrive (although when don’t we!) in order to finish up the last round of installations and configurations in order to have her science ready. With tasks completed in time, we packed her up with our equipment and food and were immediately pleased with what felt like an infinite amount of storage space (don’t worry R/V Physalus, we still love you). 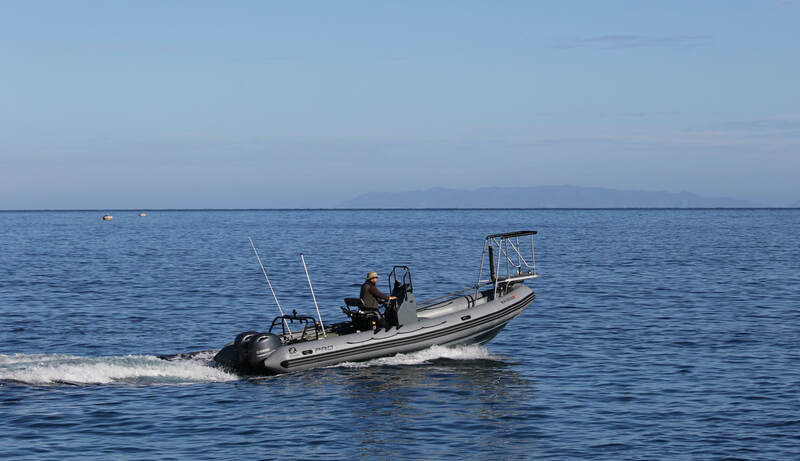 With her ample space for equipment and persons, her speed to get us on scene, and her comfort when working in rough conditions, she quickly proved to be an invaluable asset to our research and conservation efforts. 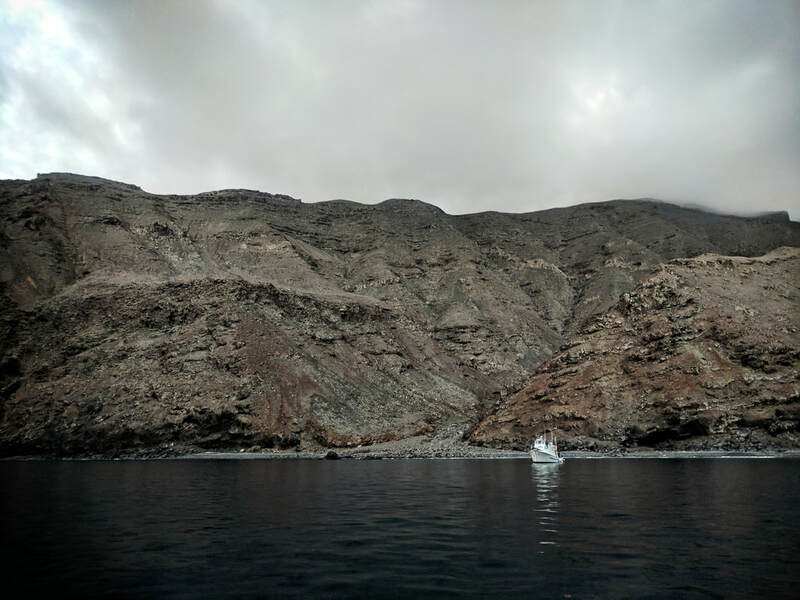 Greg and R/V Phoenix in Wilson Cove, San Clemente Island. ​During this project, we spent 73 hours on the water and surveyed 868 nautical miles. 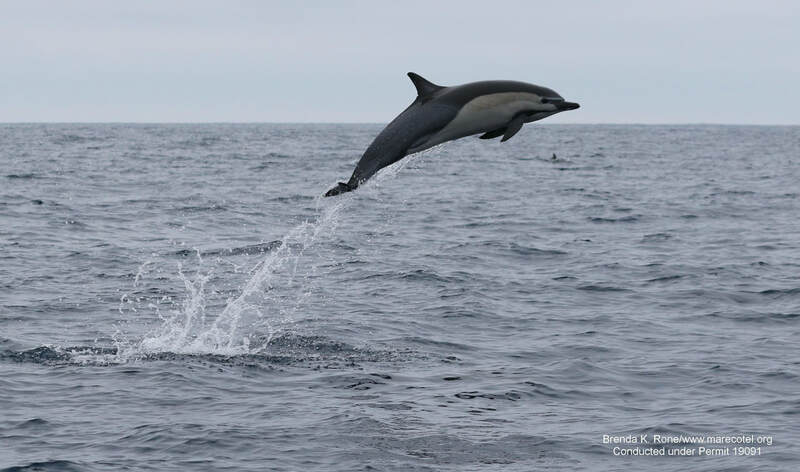 We documented 53 sightings of 11 species: minke whale, sei whale, Bryde’s whale, fin whale, blue whale, humpback whale, Cuvier’s beaked whale, Risso’s dolphin, common dolphin, Dall’s porpoise, and Pacific white-sided dolphin. Survey effort and sightings from the November 2017 project. 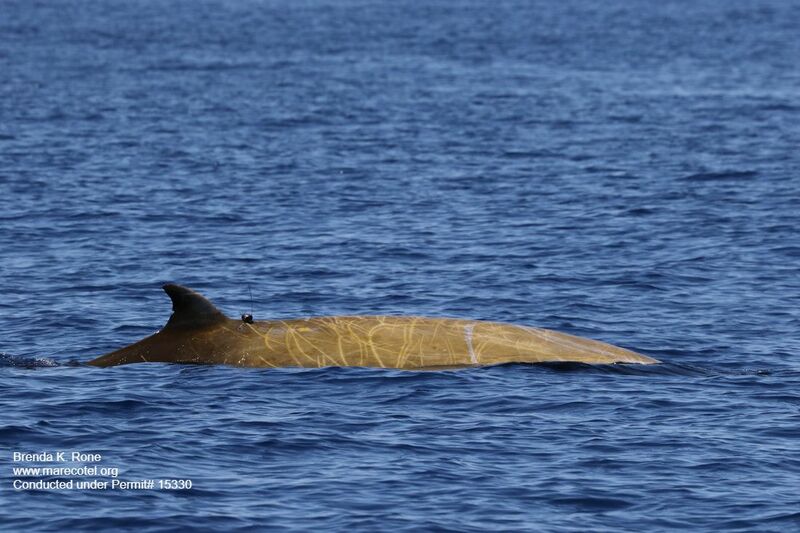 ​It was a quiet project for beaked whales. In fact, we only had one encounter of a single animal for one surfacing despite acoustic detections. We define “beaked whale weather” as a Beaufort seastate 2 or less with minimal swell. They are cryptic animals and near glass calm conditions are needed to see, hear, and approach in time before they slip back down for another dive. These dives can range from 20 min to 2 hours depending on their behavioral state with surface times only averaging 2 minutes. The lack of visual sightings for this trip can be attributed to a fair chunk of uncooperative weather. Even rain made an appearance which is really nothing abnormal for us Pacific Northwesterners, but on one lucky morning, we were gifted one of the most vibrant rainbows either of us have seen. Unfortunately, there wasn't a beaked whale at the end of it. ​We had a few noteworthy encounters this trip. The first was of a fluking fin whale. 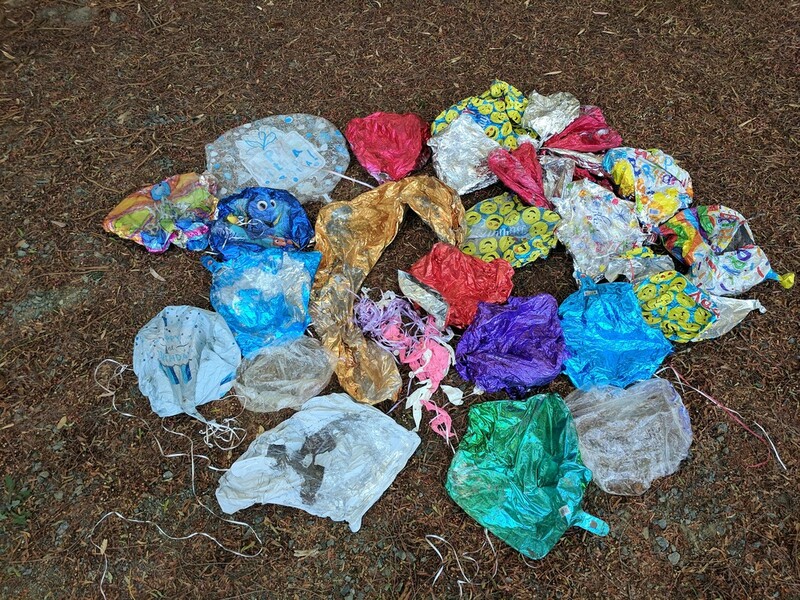 Unlike whales such as humpbacks, blues, and grays, this is not a common occurrence for this species. In fact, for one of us, this was only the second time this was observed, the first time being 19 years ago in another ocean! This whale is a genetically confirmed female identified as ID326 in our catalog and has been sighted in Southern California nearly every year since 2009. This whale is so unique that when we posted this fluke photo, she was immediately recognized as “Flukey” by Alisa Shulman-Janiger. 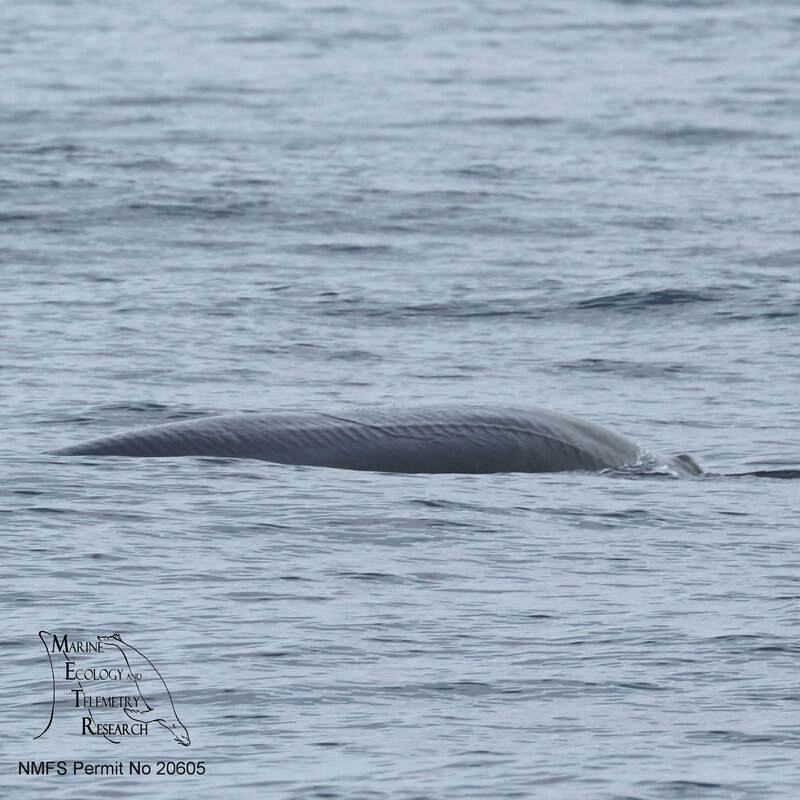 The beautiful and rarely observed fluke of a fin whale. This diving behavior was characteristic for this individual, ID326, (for unknown reasons) as she raised her tail on every dive. 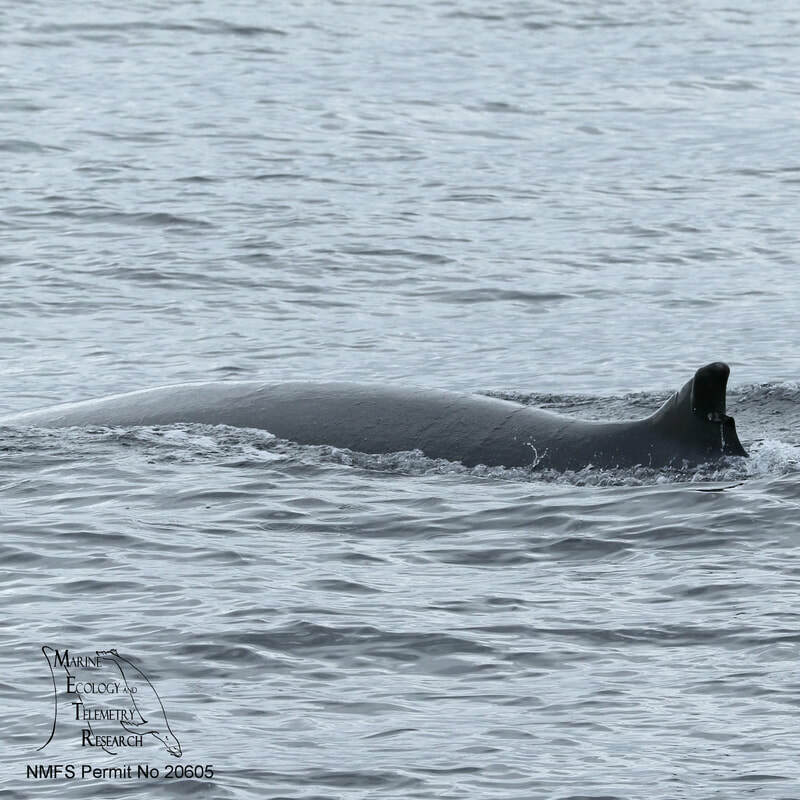 ​We also documented three Bryde’s whales, a species we don’t typically encounter frequently in our study area. One individual had a well-healed, large propeller scar caused by a small vessel, a harsh reminder of the threats these animals face on a daily basis. The propeller scar ran down the right side of this Bryde’s whale from the blow hole past the dorsal fin. 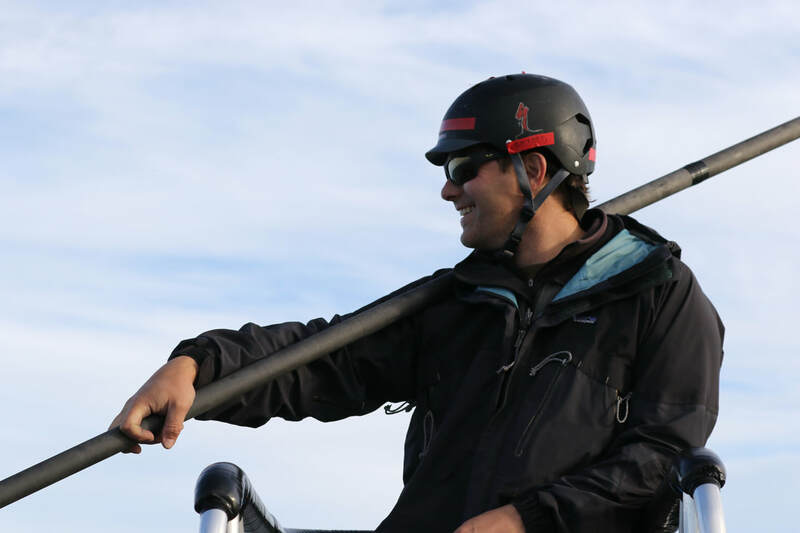 ​As part of a collaborative research project funded by the Navy to assess range dependent behavioral responses of fin whales and beaked whales to Navy sonar, we deployed a new type of high resolution dart attached archival tag on a fin whale while on a sonar training range. This tag is designed to stay attached for 2 to 4 weeks and must be recovered to download on board data. Types of data include depth, temperature, 3-D movement, and GPS locations. 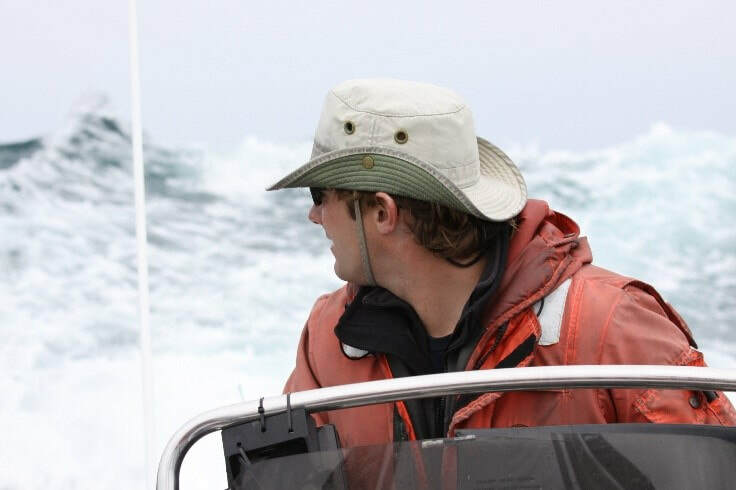 Greg waits for the fin whale to resurface for a tagging approach. The long carbon fiber pole is used to attach the tag as shown in the video below. ​So what happens when you have left the island, boated the 55 nautical miles back to the mainland, unpacked all the gear, cleaned up the boat, and literally just summarized the data for the trip, when you receive that all important transmission signal indicating the tag is off the animal? You change your travel plans (thank you Frank and Jane Falcone for making this change seamless), immediately prep and repack the boat, sleep a few hours, leave at 4 am, and pull off a marathon 11 hours from door to door with a 158 nautical mile round trip tag recovery in some sporty sea conditions. The 158 nautical mile roundtrip track of the tag recovery on 13 November 2017. The Navy range is the black polygon on the west side of San Clemente Island. 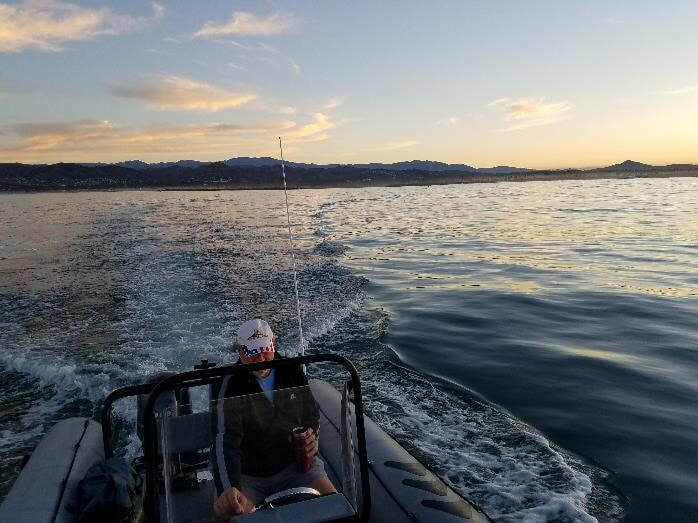 ​​As we headed offshore, the seas picked up as anticipated, and since we had no option but to go in the direction of the tag, we were served up free refills of saltwater face shots. In order to successfully recover this tag in a time crunch, several resources were utilized. First, the tag transmits a signal through satellite which provides a time and position. Second, we were fortunate to have Russ Andrews available to monitor the computer back in Washington. He swiftly calculated drift estimates (essential given the offshore conditions) based on distance and direction between locations and our time of arrival. Third, once in the area, we set up the goniometer which consists of an antenna that receives the signal transmitted from the tag and an output device that provides a direction to the tag. Brenda is using the goniometer to locate a tag. This is not the actual event. It was wet out there! No cameras were sacrificed during this recovery! ​We made one brief pass through the area, made a turn to port and spotted it floating by an inquisitive gull. Ah yes, we should add that gull as the fourth resource used to retrieve our tag. Birds unknowingly volunteer frequently to help with whale research. With the tag back on board, we exchanged a couple of high fives. 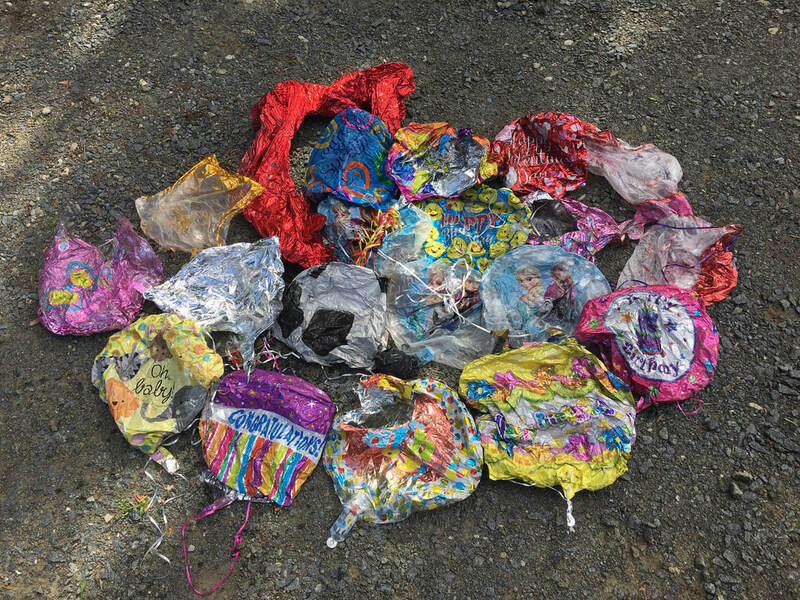 It may sound like a lot of effort to deploy and recover this technology but the information that we have retrieved from this one tag is invaluable. We tagged this whale on the range and documented the behavior and movements before, during, and after military activities, the primary goal of this deployment. This tag was worth more than just it’s monetary value. Brenda’s cheesy grin sums up this trip. 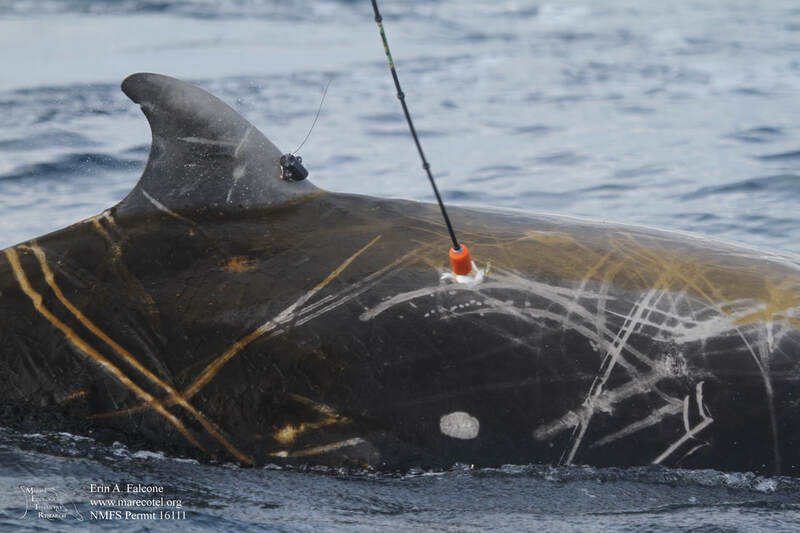 With the tag back on board, we were thrilled to call our first deployment of this new tag a success! ​​We will be back down in California in January 2018 in support of multiple projects. MarEcoTel would like to thank U.S. Pacific Fleet, Living Marine Resources, Office of Naval Research, Naval Undersea Warfare Center, Southern California Offshore Range, San Clemente Island personnel, and Frank and Jane Falcone for support, assistance, and collaboration. Scientists from Marine Ecology and Telemetry Research (MarEcoTel) and a team of collaborators have just released the findings of a new study into how whales are affected by military sonar in the journal Royal Society Open Science. 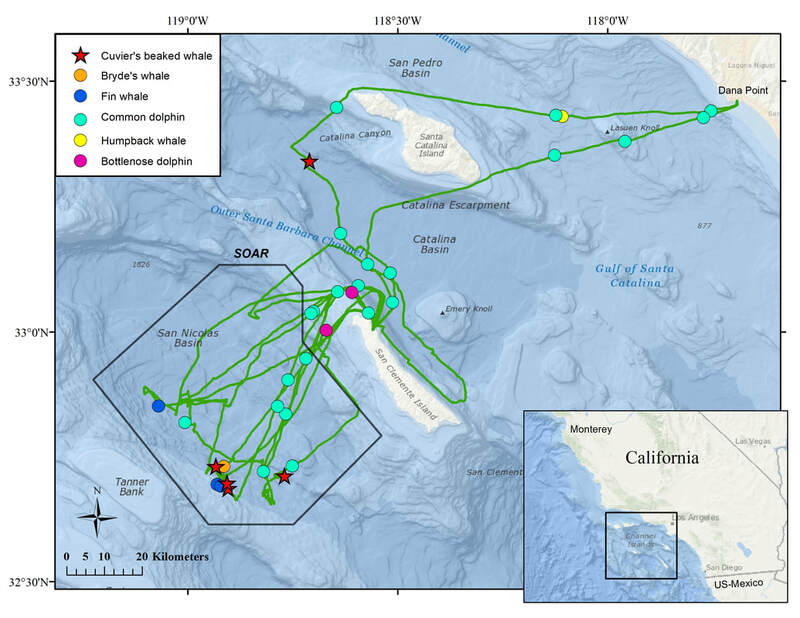 This study focused on Cuvier’s beaked whales that live off the coast of Southern California in an area the US Navy frequently uses for training exercises. This is the species most frequently observed to strand in association with sonar use in other parts of the world. 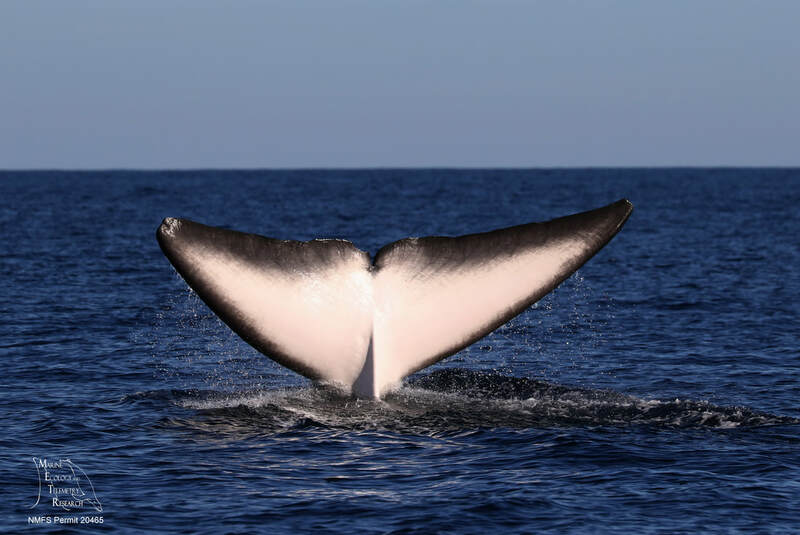 Using small, dive-recording satellite transmitters attached to the whales’ fins, they monitored the behavior of 16 whales for periods up to several months, allowing a comparison between how whales behaved when military sonar systems were active and when not in use. This study provided the first large sample of whale behavior with known exposures to ship sonar, which have been studied previously, and to helicopter-deployed sonar that has received much less attention because it is considerably quieter than the sonar used by ships. It also allowed researchers to identify the range of distances to sonar that whales changed their behavior. A variety of behavioral changes were observed, including increased dive duration and an increase in the amount of time between the very deep dives these whales conduct when they are searching for food near the ocean floor. Some of these behavior changes were evident when sonar was used up to 100 km away, though they became more pronounced the closer the sonar was to the whale. One surprising finding was that whales tended to respond more strongly to the quieter helicopter-deployed sonar than to ship sonar at a similar distance. In fact, one whale dove for an astonishing 2 hours and 43 minutes, a new mammalian diving record, while a helicopter deployed its sonar nearby. The authors suggest that these whales may respond more strongly to helicopter-deployed sonar because it is used in a less predictable way. While none of these whales, who appear to preferentially use this region despite the regular disturbance, stranded or died as a result of sonar use during the course of the study, these findings underscore the importance of understanding what these responses mean for the health of both individuals and populations over time. They also suggest that in an area where whales are frequently exposed, the context of sonar is a potentially important predictor of behavior in addition to sound level, which is how sonar impacts are currently estimated. A copy of the paper can be downloaded here (﻿Falcone et al. 2017﻿), or by going to the Royal Society Open Science Website (Falcone et al. 2017). 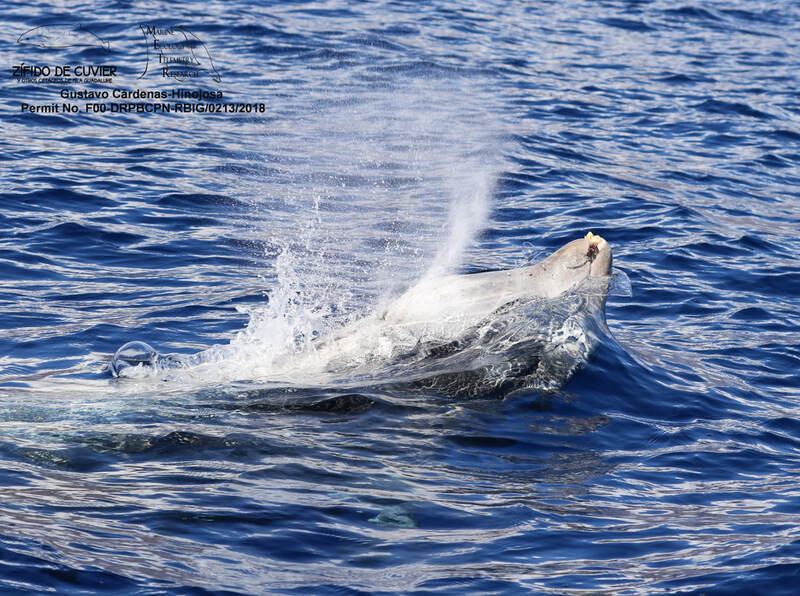 An adult male Cuvier's beaked whale surfaces to breath. Mature males in this species have two small, conical teeth that erupt from the tip of the lower jaw; this whale has stalked barnacles growing from his teeth. Males use their teeth to fight with one another, and older males, like this one, will become covered with long, linear scars as a result. 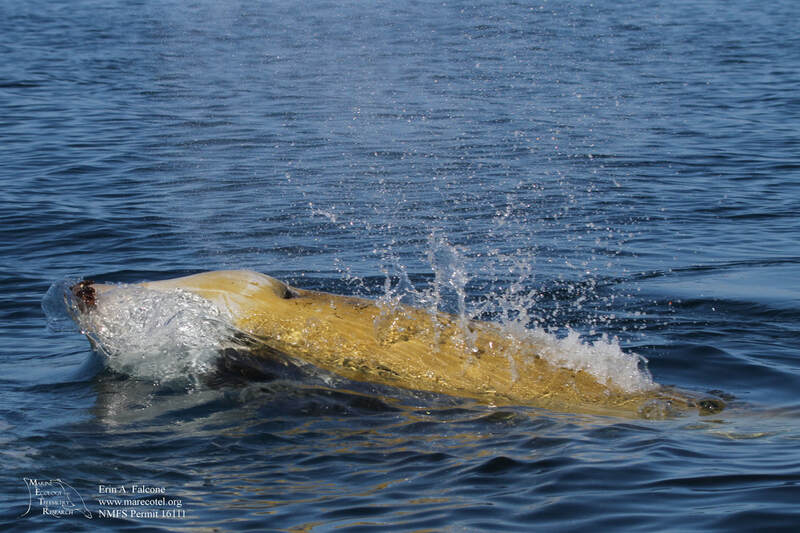 The yellowish coloration on this whale is caused by a type of algae that grows on the whales' skin. A LIMPET satellite tag deployment on an adult male Cuvier's beaked whale. The deployment arrow can be seen rebounding and leaving the small tag attached at the leading edge of the dorsal fin. 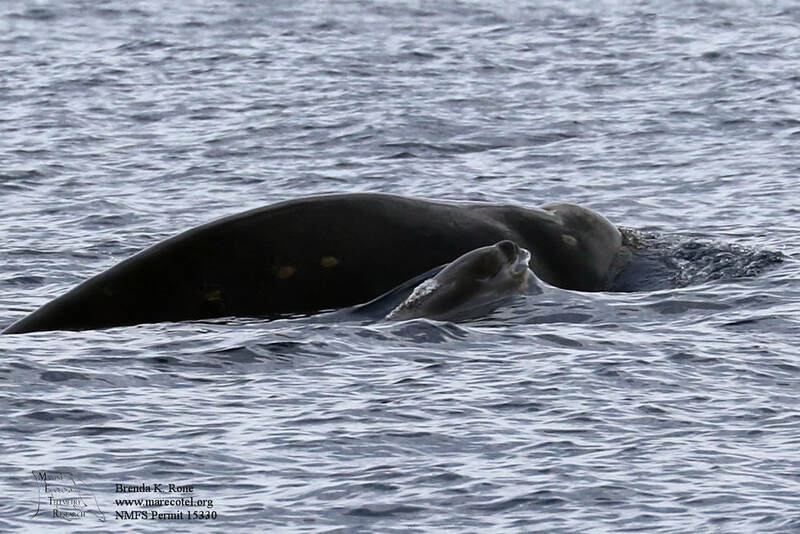 A young Cuvier's beaked whale calf surfaces to breath alongside its mother. We just completed our fourth field effort of 2017. This was our third trip down to San Clemente Island this year. This is a continuation of our long-term study on potential impacts of military activities on beaked whales and other species. 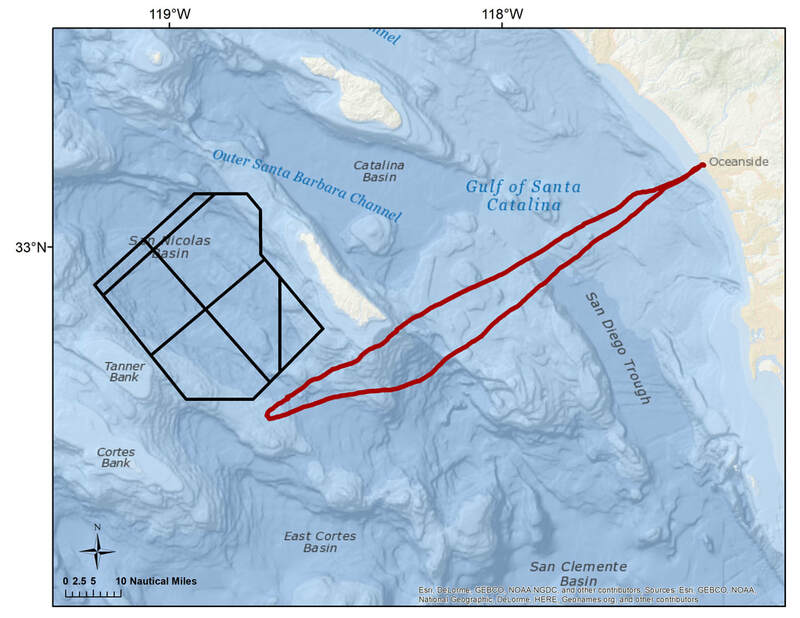 The U.S. Navy’s Southern California Anti-Submarine Warfare Range (SOAR), which extends west into the San Nicolas Basin from San Clement Island, is a focal training area within the Southern California Offshore Complex (SOCAL). SOAR consists of an array of 88 bottom-mounted hydrophones that are used for real-time, three-dimensional tracking of undersea vehicles. 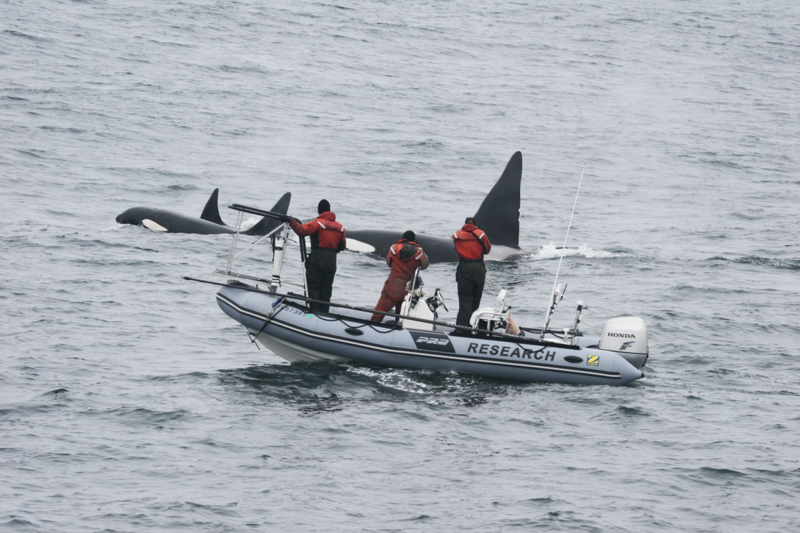 During this project, we work closely with M3R (Marine Mammal Monitoring on Navy Ranges). 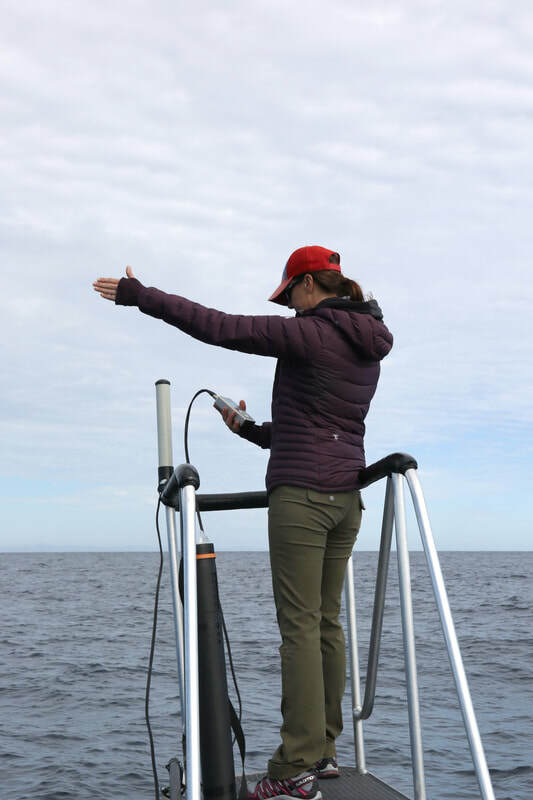 Acousticians monitor these hydrophones looking for vocalizing beaked whales and other species to identify areas where we should focus our efforts. Beaked whales vocalize during deep foraging dives. M3R tracks the locations where the vocalizations are occurring to provide the best opportunity for us to locate these animals once they have ceased foraging at depth and return to the surface. This survey effort took place from July 22-30th. During that time, we surveyed 666 nautical miles and spent over 70 hours on the water searching for whales and dolphins. In total, we documented seven species: Cuvier’s beaked whale, humpback whale, short-beaked and long-beaked common dolphin, bottlenose dolphin, bryde’s whale, and fin whale. It was rather quiet for large whales during this survey. 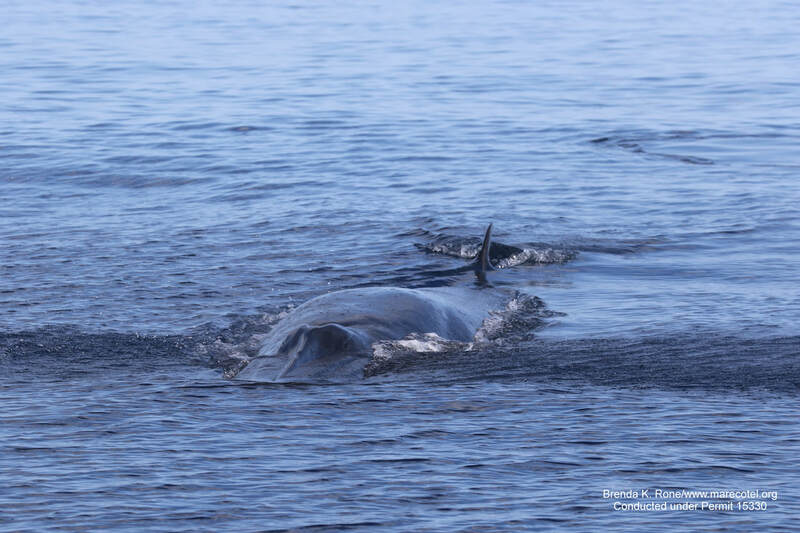 We documented one humpback whale, five fin whales (two mom/calf pairs), and a Bryde’s whale. Bryde’s whales are infrequently sighted so we were very excited to document the presence of this animal. While it was pretty quiet for large whales, we were quite successful in locating beaked whales. In all, we had five encounters totaling 9 unique individuals including 2 calves. 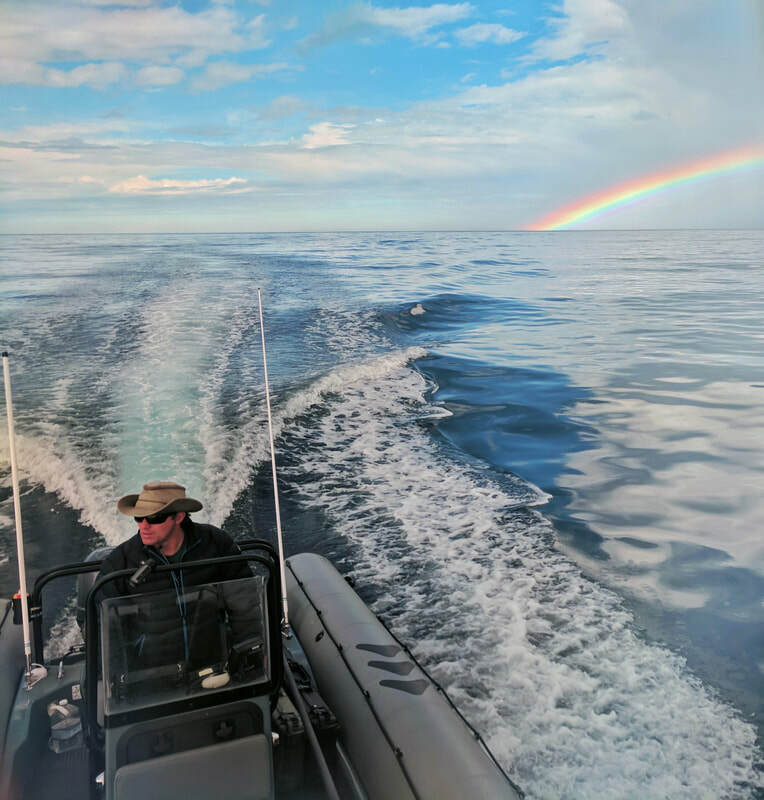 We started out the trip with some luck as we documented our first encounter of beaked whales on the very first day on the water as we surveyed from the coast out to the island. Later in the week, we were able to deploy a satellite tag on an adult male. 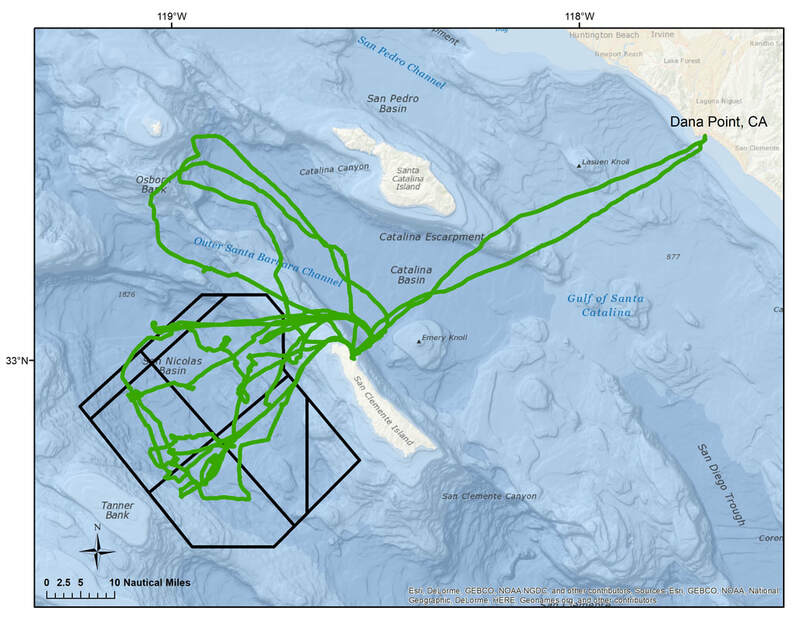 In addition to recording dive behavior and locations, this tag provides superior location estimate over a standard Argos tag with the inclusion of Fastloc fast-acquistion GPS developed by MarEcoTel and Wildlife Computers as part of a project in collaboration with the Naval Undersea Warfare Center and was funded by the Environmental Security Technology Certification Program. This was our third deployment of this type of tag on a Cuvier’s, all occurring this year. When we relocated this animal four days later, he was still associated with the same individual from the tagging day as well as a new one. In addition to quality photographs of all animals, we collected nine water samples from the footprints to contribute to a study looking at environmental DNA conducted by the University of Oregon. 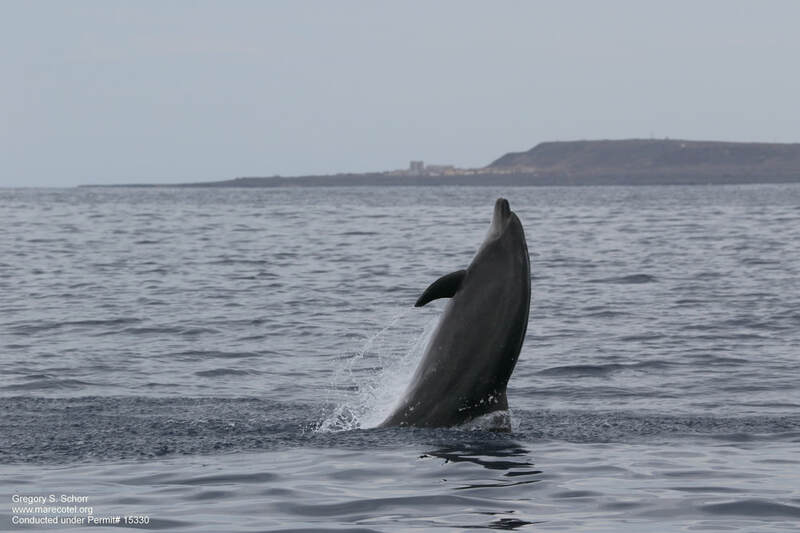 An additional five biopsy samples were collected from bottlenose and common dolphins to contribute to ongoing studies. Funding for this research was provided by the U.S. Navy Pacific Fleet. 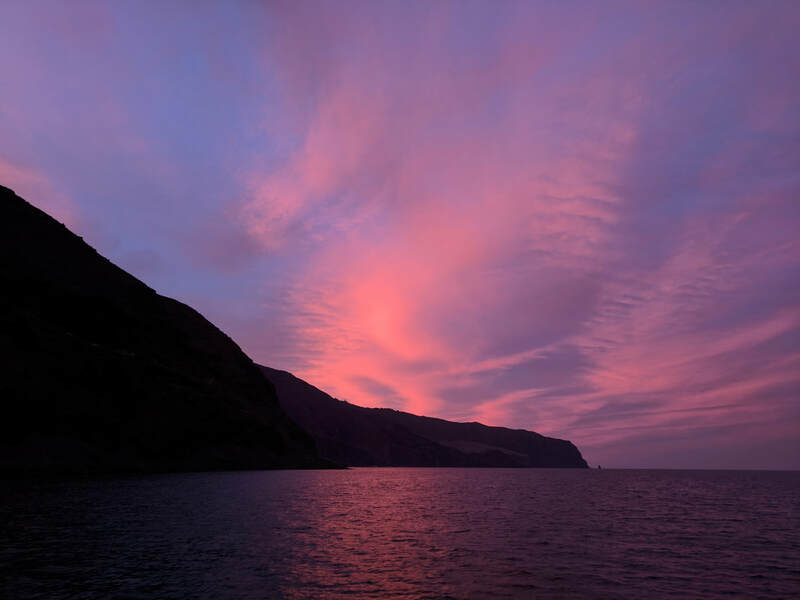 Our next field effort will occur in November and we will be back on San Clemente Island. 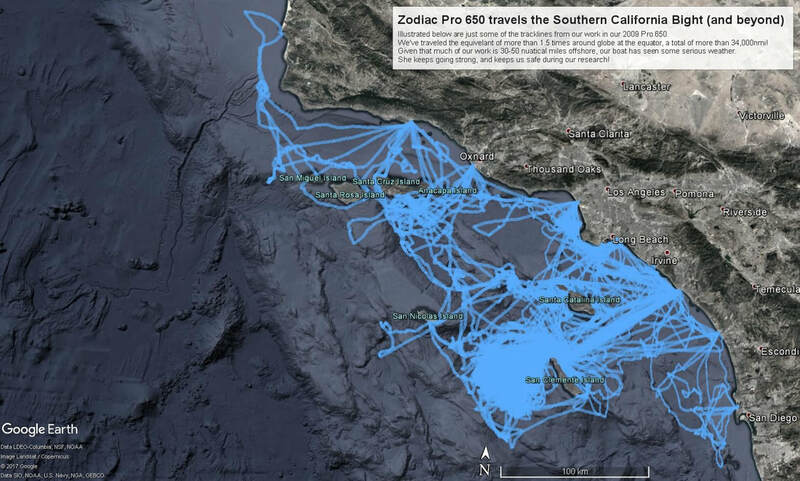 This is a map showing all our sightings and our Garmin GPS tracks. 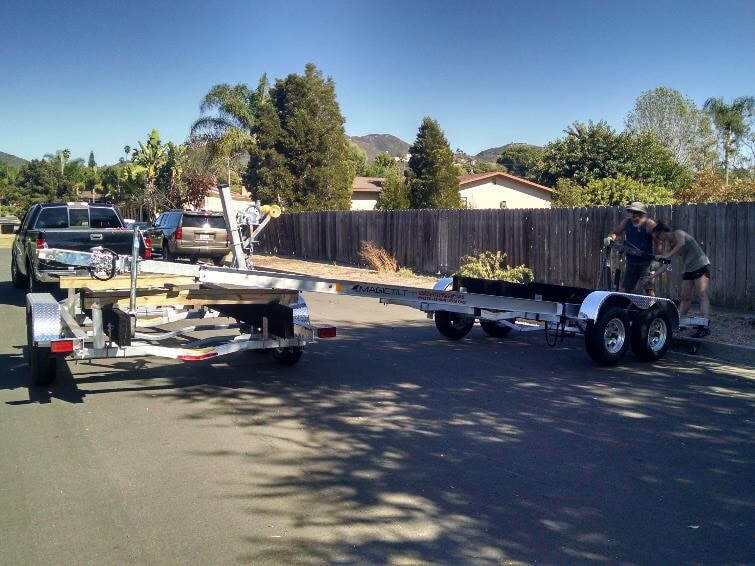 We cover a lot of ground for two people and a 21 foot Zodiac! We had an infrequent visitor to the area, a Bryde's whale. 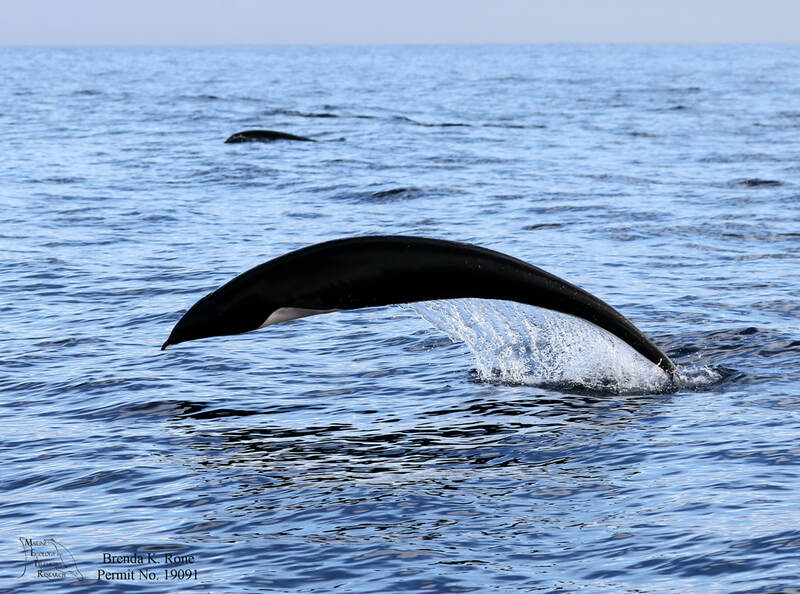 They look very similar to sei whales and one of the key identifiers is the three ridges visible on top of the head. For a brief moment, it was curious and turned to investigate our boat. We deployed a GPS tag on an adult Cuvier's beaked whale. We had two bottlenose dolphin encounters during this trip with several neonates (newborns) observed. This sighting occurred relatively close to the island on the west side. This is one of two Cuvier's beaked whale calves we documented during this field effort. These sightings provide information on vitals such as calving interval, reproductive rates, gender identity to name a few. All of these are important for population dynamics and anthropogenic assessments. 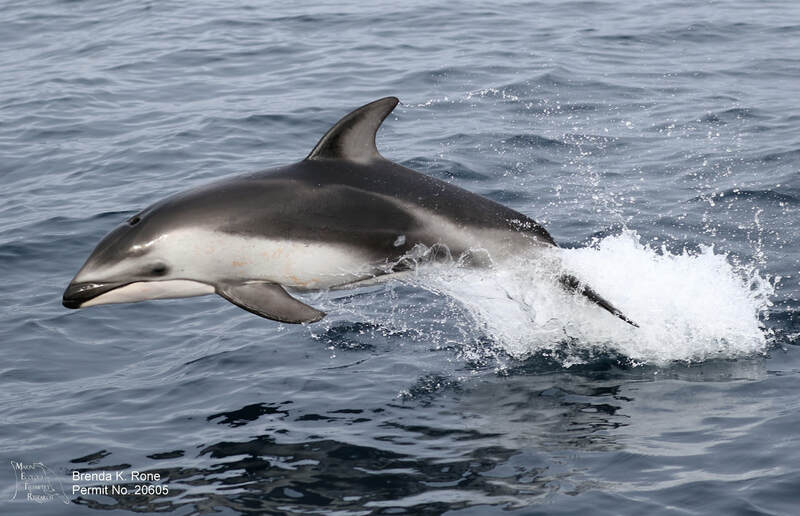 One thing we can usually count on is numerous sightings of common dolphins. Both short-beaked (pictured here) and long-beaked are common visitors to the area.